Image caption Green Party leader Natalie Bennett said her party was in an "increasingly strong position"
The Green Party in England and Wales says it has passed 20,000 members for the first time. Its sister party in Scotland grew from just under 2,000 members before the independence referendum to over 6,000 by the start of October. In the European elections in May the Greens came fourth, winning three seats and just under 8% of the vote. The party in England and Wales will contest 75% of seats in next year's general election up from 50% last time. 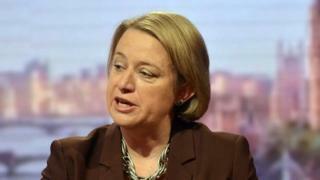 Party leader Natalie Bennett said: "This isn't a 'new' Green Party; our understanding that social and environmental justice are inextricably linked, and our democratic methods of policy and decision-making haven't changed. "More and more people in England and Wales are hearing that we are calling for a £10 per hour minimum wage by 2020, for rich individuals and multinational companies to be forced to pay their fair share of tax, for the finance sector to be made to serve the needs of the real economy, rather than threaten it with disaster." The Green Party's sole representative in the House of Commons currently is former leader Caroline Lucas, who is the MP for Brighton Pavilion. In Scotland the Greens were the only party with elected representation, other than the SNP, to support independence. Its membership has tripled in the past month. The co-convenor of the party in Scotland, and one of its two MSPs, Patrick Harvie, said "we are determined to maintain the momentum built up during the referendum debate". "There is a real buzz about the party, in our branches across the country, as we prepare for our biggest ever annual conference in Edinburgh just over a week from now." Membership of the Young Greens has also more than doubled, from 1,790 in April to 4,052, the party says. Can the Greens' economic ideas grab the attention of voters?